It is crucial that you consider making a Will. Some situations are straight-forward, whereby if one spouse passes away, everything will pass to the surviving spouse. However, even in these circumstances, it is advised to create a Will to avoid uncertainties and emotional strain during a difficult time. Please call me for a no obligation chat about your Will in Northampton on 0800 3 10 11 12 or contact us online. 1. WILL INSTRUCTIONS – Please telephone the offices to make an appointment with our will advisor, or if this is not convenient, we can take instructions over the telephone or email. Before providing your instructions you should have a think about what you want to happen to your estate when you pass away. We will ensure that everything is covered and you understand the legal implications of the contents of your will. 2. DRAFT & APPROVE WILL – We will then prepare a draft will which will be send to you for your approval. This is to ensure that there are no mistakes and you may well change your mind after the initial appointment. 3. SIGN WILL – Once the will has been approved, we will arrange for you to come into the office to get the will legally signed. If you are unable to come into the office then we can send the wills to you with detailed instructions on how to sign. The first step to take when making a will is to sit down and gather together all the information that is needed. This includes names addresses, dates of birth and a note all of the assets you own and of your debts and liabilities. Items of a high value should be listed separately as this could cause arguments if it is just left within the residue of the estate. You should think who you want to gift these particular items too. Once you have mapped out your property and assets, you should contact a solicitor to make an appointment. Here at Seatons, we can take instructions over the telephone or over the internet. If you want to meet face to face then we offer appointments in any of Northamptonshire offices or even a home visit should that be more convenient. Once you have decided to make your will, we will then discuss with you what you want to include in your will. On the most basic level a will should detail who you want to benefit under the will, what legacies and sums of money or items you want to leave and what happens to children under the age of 18, who is going to sort out your estate and what happens if the people you want to benefit under the will die before you. 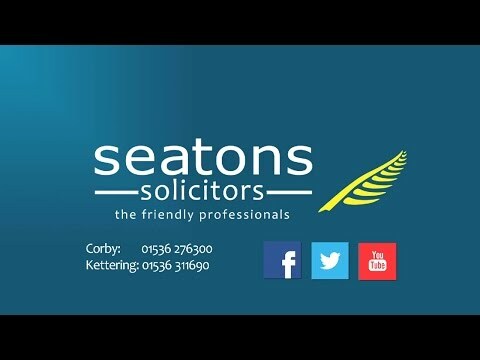 That may seem straight forward but it is always advisable to seek a specialist advice if you jointly own a property, you have family members that may make a claim against the will (such as a second marriage), you have children under 18, you have property abroad or you have a business. When you have decided the different aspects of your will, we will then create a draft for you to check over and ensure that everything is correct. You need to check and ensure that your families names are spelt correctly and that you have split the assets as wished. Once it has been confirmed that you are happy with the contents of the will we prepare the final document to be witnessed and signed. We will arrange for you to sign your will, either at our offices or your home. When you sign the will you must have two witnesses present when you sign. They will then have to sign the will and provide their name and address. This covers the situation whereby someone argues that the person making the will does not have capacity and have been forced to create the will. If you have witnesses to the signature, they can confirm that you understood the terms of your will and had mental capacity when it was signed. Once you have correctly signed and witnessed the Will, we will provide you with a certified copy for your safe keeping. We do advise keeping your will in our strong room and we do this at no extra charge. It is advises that you review your Will every 5 years. This prevents the situation whereby a family member has been born, or sadly left, meaning you have to reevaluate your assets and ensure your Will still follows your wishes. You cannot amend your Will once it has been signed, a document called a codicil is used instead. However, if it is major changes to be made, then it is advised to create a new Will. Although it may seem cheaper creating your own will, there can be hidden complications that you have not thought of. By instructing a solicitor, you can rest assured that all of the legal matters relating to your will have been dealt with by a professional and have been done right. Our solicitors have years of expertise and expertise. My name is Adrian Chambers. I am a lawyer who specialises in creating and preparing Wills in Northampton. Please contact us for a free, no obligation chat at office on 0800 3 10 11 12 or contact us online. In the following case, a couple fraudulently tried to change a deceased person's Will and as a result, were given prison sentences for their trouble.